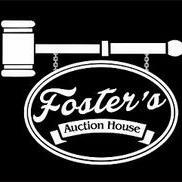 FOSTER'S ESTATE SERVICES is not currently an active member of EstateSales.org and may or may not be conducting estate sales at this time. We recommend browsing our directory of current estate sale companies in the Caddo Mills, TX area. ANTIQUE CROCKS, PRIMITIVE FARM IMPLEMENT AUCTION - ABSOLUTE SALE!! HOFMEISTER'S AUCTION - QUALITY USED FURNITURE, ANTIQUES, HOUSEHOLD ITEMS & MUCH, MUCH MORE!! HOFMEISTER'S AUCTION (A.K.A. CUMBY AUCTION) FABULOUS ESTATE AUCTION & GLASSWARE, GLASSWARE, GLASSWARE, AND MORE! !